The Method. Ever since Brando tore onto the screen in the 1950s, many self-described serious actors have sworn by it. Devotees of the Method absorb themselves entirely in a part, on and off the set. To most of us, it seems like the height of pretension But while we have had our share of hammy Shelly Winters grandstanding resulting from method acting, we’ve also had generation after generation of great actors. So, who am I to put down someone’s process? Still, there is always the question of whether someone can absorb themselves so heavily in a role that they become that person? It sure looks like that’s the fate that befalls famed actress Samantha Sherwood (Samantha Eggar). For years, she and Svengali-like director Jonathan Stryker (John Vernon) have worked in tandem, an unbeatable team. Recently, Sherwood has bought the rights to the story of Audra, a project about a woman driven mad in which she hopes to star. When Sherwood is unable to find a convincing voice for the character, she and Stryker arrange to have her committed on the false pretenses that she has actually gone insane. Sherwood refuses to come out of character, even in private meetings with Stryker. Eventually, her commitment to the part coincides with the influence of her surroundings and she appears to have truly lost her mind. Fearing that Sherwood is no longer reachable, Stryker announces a weekend retreat at his cabin. A handful of wannabe starlets are to compete in an intense extended casting session. The prize is the role of Audra. Sherwood arrives in time for one of these sessions. She has learned of the retreat and was upset enough to escape from the hospital. The competition starts getting bumped off and the viewer is left to wonder if Sherwood’s insanity has made her capable of murder? 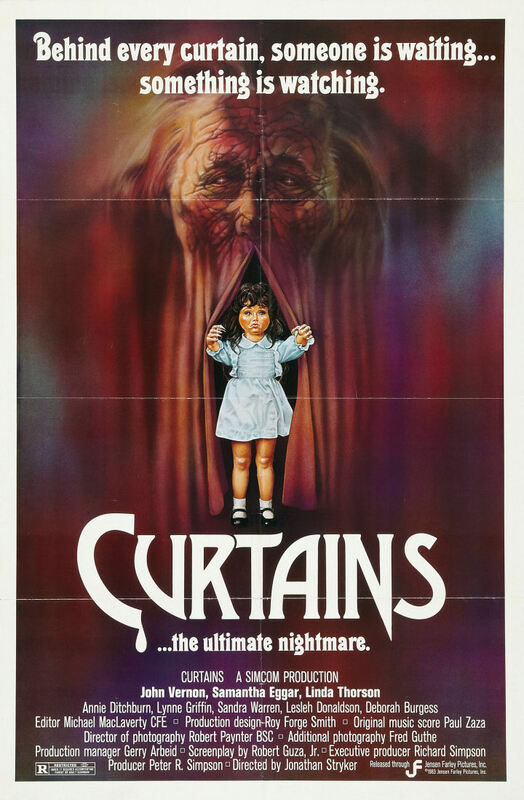 Back when I was editing Horror Express, one of my writers insisted on being called Jonathan Stryker, after Vernon’s character in his favorite horror film (It was also a slight nod to CURTAINS being billed to the fictional character instead of the actual director, Richard Ciupka.). It’s easy to see why my old writer is just one of CURTAINS’ big fans. The film is much classier than your typical slasher flick. So classy that I’m sure many people would object to it even being called a slasher, preferring that you refer to it as a psychological thriller or something. Sorry guys, it’s a slasher. But if it helps, it’s a good slasher. Ciupka endows a few the characters with quite a bit of depth. Of particular note is Lynn Griffin as a comedian who wants to be taken seriously. Vernon is wonderfully menacing as the director whose talent and dedication make people willing to take his abuse. Lesleh Donaldson is a spirited young woman who questions the lengths she has gone in order to become part of this project. By this time, Eggar was already gaining a new generation of followers, and was not above taking roles in genre productions that had a bit more polish than most. Witness her memorable turn in another recent Canadian production, THE BROOD. Unfortunately, other characters aren’t so lucky. One male character (Michael Wincott) could be the killer or just a red herring. But since he’s so anonymous, chances are you’ll forget he was in the film to begin with. A scene on a frozen lake is particularly memorable. But the second act relies on the dramatic scenes to keep the viewer interested as attempts at scares and tension are unsuccessful. Fortunately, things pick up towards the end, enough to throw CURTAINS into the recommendation pile. The direction is tight and the atmosphere effective. The film was reportedly plagued with problems and reshoots, something which I’m sure contributed to the film’s uneven pacing. I suppose we should be thankful everything turned out as well as it did. Recommended.